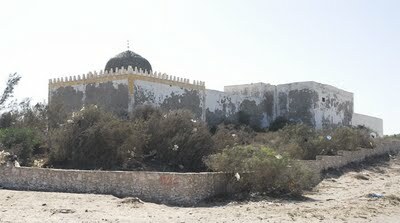 The tomb of the Marabout Sidi Mogdoul. 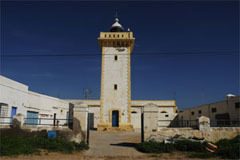 A common understanding is that the name Mogador, likely is a deformation of the name Sidi Mogdoul. It is also said he was a Scottish mariner with name MacDougal who got wrecked on the coast some centuries ago and acquired the status—and pronunciation of his name—by which he is now respected. And from Mogdoul to Mogador is justone step! During the middle ages a muslim saint ( marabout) named Sidi Mogdoul (Sidi Megdoul) was buried in Essaouira. It is said that he belonged to the Regraga brotherhood. Also that he carried out twenty times the pilgrimage to holy places of islam , that he for 40 years fighted the infidels and died at the age of 140.
the ships entering the the port of Essaouira.